I first came across the California based jewelry supplier, The Bead Shop, through their marvelous tutorials on Youtube. I wrote about their Multi Patterned Leather Wrapped Cord Bracelet Tutorials and Mosaic Tila Bead Headband and Bracelet Tutorials because they were such refreshing approaches to popular techniques and beads. The Bead Shop was founded in 1982 by Janice Parsons. It is the online presence of the old Bead Shop once located in Palo Alto. They said, "Based on the culture of our old brick and mortar store, our website was created to reflect the artistic passion and beading knowledge of its owner and team. We continually push ourselves to provide our customers with new inspirational videos and handouts that give beaders of every skill level the confidence to create beautiful jewelry." Their shop sells all sorts of jewelry supplies but with a distinct emphasis on those needed for micro-macrame, knotting and wrapping jewelry. They've clearly sourced the world for the best materials as you can get supplies like Irish waxed linen, Korean waxed cords and Chinese knotting cords. 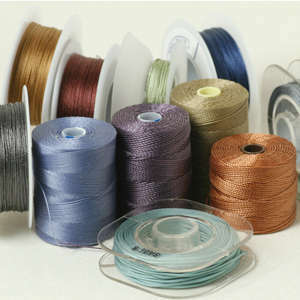 They also stock many colors of C-lon, Superlon and the US made Tuft cord which are used for micro-macrame jewelry. There is a large range of leather cords and also something called Compassion Suede which is not made from animals. 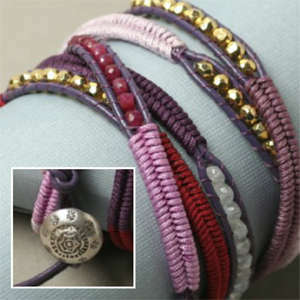 Their colorful range of threads, cords including leather come in different sizes to suit the varying bead hole sizes. I found their guide, Stitchionary, extremely useful in sorting out what sort of threads and cords to use for what projects. Indeed their site is peppered with useful tips and tricks. For example, Chinese knotting cord (0.5 mm) is used for the herringbone wrapped Greek leather bracelet shown above. I featured the tutorial before but it doesn't hurt to see the video tutorial by Nicole Anderson again. Love the changes of laddered beads along the long bracelet! Also used in the video is KO thread. KO thread is made in Japan and is specifically designed for beaders. It's a "strong, fray-resistant and non-stretchy thread" which can be used with needles but is stiff enough to use the tail as a self needle. That last bit is useful if you do like making bead wrapped cord bracelets. 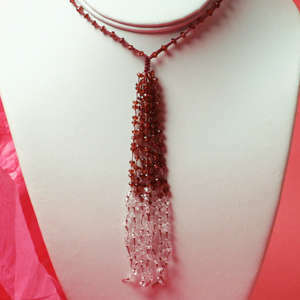 Heart's Desire is a lovely micro macrame necklace design tutorial by Janice Parsons.Gemstone rondelles are knotted together with micro C-lon. Check out the video tutorial here. The Bead Shop also carry beautiful kimono cord.One of my favorite Bead Shop tutorials is one of the easiest. A must see! Janice Parsons demonstrates in this video, the ancient technique of silk wrapping which requires no glue or visible knots to make this kimono cord necklace. It can be wrapped twice to make a bracelet and without the button, a eyeglass cord! A fun store to explore! I can attest to that as I have spent hours on the site. The Bead Shop is sponsoring a $100 gift certificate for any of their products. If you'd like be a winner, please make a comment below. Make sure you leave contact info below if you do not have an online shop or blog. It ends in a week's time at 6 pm EST Monday, February 10 , 2014. I will pick the winner randomly and announce the results as soon as possible after. So be sure to leave a contact email if you don't have an online link or make sure you come back and check! Otherwise I will redraw in a week. Good luck! Thanks for introducing me to this shop. They have lots of cool things and I'd love to so some shopping there. I would Love to enter the contest for the $100 Bead Shop Gift Certificate. Thanks for the good information. I'd love a new place to get cord. I'm a subscriber. Thanks for the chance to win. Lot the new ideas for headbands and bracelets. I would love to try out the techniques with some of their products. Thank you for introducing us to a great source of product and knowledge. I am going to tell everyone. It'd be a superb gift for my birthday next week!!! Pearl, you always find the coolest places for us to visit! Thank you for yet another great resource, and thanks for the giveaway! Thanks for posting about this shop. I'd so love to win and get some of their supplies. Sounds like a great shop. Will be checking them out. I'm a blog subscriber. Email should be in blog profile. I LOVE Bead Shop! Thanks so much for a chance to win! I follow your blog and on facebook - I am sharing your post right now! Just tweeted about you post/review and giveaway. Hi pearl, I love your blog and I love bead shop too! Yes please enter amirasdesigns@gmail.com or mar061555@gmail.com. Thank you! I would love to enter the contest. Thank you for blogging about them. Hi pearl, I love your blog and I love bead shop too! Please enter amirasdesigns@gmail.com for a chance to win! Thanks so much! That KO Thread sounds fantastic! I'm always losing my needles, or not being able to find the right one, and end up ditching my plans over it. Having a thread that I could skip the needle for would be just plain wonderful. As it stands, the only one I can use like this without constantly trimming the frays, is tiger tail, and it can be too stiff for a lot of things. When in lived in San Francico I shopped at the Bead Shop when I was in the Palo Alto area. There was always an interesting assortment of beads, supplies & classes, & the virtual Bead Shop continues the tradition. I live where I have limited access to beads & supplies, so mail order shopping is important to me. This gift certificate would go a long way toward feeding my need to bead! I subscribe to this page and whenever I check my email, this is always one of the first I open!! Love it, thank-you. Thanks for another wonderful giveaway offer and another great beading resource. I absolutely love the Beadshop site and tutorials. I have to admit, I'm hooked on wrap bracelets and I love the headband. I would love to win the $100 so I could purchase the tray among other items to increase my stock and make more bracelets. Great selection of tutorials. I am going to try the silk wrapping one when I get home from work. Thank you for the chance. I'm in love with the Beadshop site and all the goodies they offer. The tutorials are fantastic and I can't wait to increase my stash to make more wrap bracelets not to mention the headband. Thanks for the opportunity to enter a fantastic giveaway. Neat shop - thanks for the introduction. What a lovely store. So many new techniques to try out! So exciting! Would love to enter the contest. Love the bracelets! I really love the video. I am going to share it with my friends who work with silk and fiber! This shop has good products. I love the Bead Shop! I've ordered from there a number of times and love their fast shipping! Thanks for the chance to win this great gift certificate! I would love it! I would love to win, this shop has tons of pretty things! I am a blog subscriber too. I love the Bead Shop! All their tutorials and videos are fantastic. And I love how they offer some really unique beads. Thanks for the giveaway! Beautiful colors. Looks like a great product!!! I would love to win!! I made the Herringbone Wrap Bracelet with hemp cord that I had on hand. I love the design and I know it would be truly fabulous with the Chinese Knotting Cord. I have already spent "The Bead Shop's $100 Gift Certificate Giveaway" in my mind. Fingers crossed that dreams do come true! What a fantastic prize! Talk about heaven! I'm already a blog follower, to yours and their site. I love shopping there, they are so friendly and their tutorials are great! This would be amazing, such a great shop with so many new projects to dive into. Thx for introduction to your store. Thanks for the information about the shop. I would love in win!! I found this site a while back and spent lots of $$ on supplies. Materials are fabulous and the videos are the best I have seen online. I wish I could visit the shop, but I live in NY. Actually, it is good that I don't live closer as I would have to buy beads everyday!! Would love to win the gift certificate! What a great giveaway! And what a great opportunity to try out the bead shop!!! What an awesome bracelet!! I can not wait to try this out, as I love the wrap bracelets, but was getting a little bored with the same old same old. What a fun way to mix it up! Thanks for sharing - I will definitely be visiting their shop a lot more! Love your blog!! I am glad to know of a resource for different types of cords--and California is not that far from my home in Alaska, so orders should come quickly. Thank you. Please enter me in the contest. I love this store and have ordered from them before. Great products! I would Love to enter the contest for the $100 Bead Shop Gift. Wow I love the Kimono necklace, I have to make one. Fab giveaway many thanks. BEADSHOP!!!!! One of my best site! I follow its video tutorial! Good ideas!! I create macrame' jewelry so...it's my site! (My blog is http://annodarte2013.blogspot.it . This is so great. They have so many beautiful gems and design options. I could look at their site all day long. I adore the tutorials at The Beading Gem's site. I've shopped at The Beadshop and used their tutorials before -- it'a a fantastic site and their staff are very helpful! Thanks for introducing them to your blog audience. I just recently found out about this store and I can't wait to make my own leather wrap jewelry. I love the selection of cords and colors they have ! I love the Bead Shop and all of their tutorials & merchandise. I have made several items with their assistance. Please pick me! Wow! More fantastic variations on the art of decorating the human body! This is what makes this particular art so fascinating and so complex and unending Pearl! Who couldn't fall in love with some aspect of it once they tried it? go. This is so evident here at The Bead Shop! I love the Bead Shop … they have helped me out with beading questions more than once. Also, they have great videos and their online shop is super! I loooooove this shop !! Beadshop.com is AWESOME! the finest quality beads and materials AND the best tutorials anywhere!! So appreciate the chance to enter this giveaway!! I love Beadshop.com. The quality and taste level of their website and products are superb. Not to mention the numerous projects for inspiration and youtube videos. This is great!!! I would love to enter the contest for the Bead Shop's giveaway!!! Thanks for the chance to enter!!! Hi there, I found the Bead Shop last summer and have been a huge fan ever since. They are so "beader friendly" not only with their video tutorials but also with their prices and shopping tools. LOVE EM! I can't wait to check out this store. Thanks for the wrapping tutorial. I'm a blog subscriber. Favorite on-line bead shop ever!! Awesome products, no shipping fee, fast shipping, and the best customer service ever! Oh...did I mention the on-line tutorials that are FREE!! I have been inspired by Beadshop.com to try so many new techniques with amazing results! Love these girls and their shop!! This looks great! Haven't looked at their shop before today, but definitely will be again!!! Thanks for introducing us to this shop - I am surprised I haven't found them before. The cord they sell is really awesome - and a fresh alternative to the usual beading "wire" used for these types of projects! I will be checking out their website for supplies! Cool giveaway. Nice to know about another shop too! Just pinned your post and giveaway. What an interesting shop The Bead Shop looks to be. Nice of you to host a give-way. The tutorial is neat. I have always loved this shop. And Pearl keep up the good work you do with your Blog! I am a long time subscriber. Looks like great products. Will definitely check out their store. Very cool new find!!! Love the selections they have on their site. Thanks for the link to such a great website - hours of fun for all. I have always loved the Bead Shop. It is a marvelous site. Uh oh, a new shop to spend money in. :) I love it, and my obsession just got a little deeper. Love all the reviews that so carefully analyze so we don't have to. I have ordered their products before and love the colors and quality! Thanks for The Bead Shop info! I've recently moved from a house to an apartment so my usual jewelry techniques (soldering, etching) are on hold - but I'm using this time to learn new techniques! I'd love to win this! I LOVE the Bead Shop! Last year I made a dozen wrap bracelets with their tools and materials and everything turned out beautifully. I love beadshop.com, I actually shopped the brick and mortar store way back in the day. I love seeing the projects you come up with. I love tutorials! Thanks for introducing the shop, I will try it out. Once again, a great blog!! You are amazing!! I love, love, love the beadshop.com and miss the PA store so much, but the online shop is excellent. I would love to win the $100 gift certificate. Thanks for the opportunity to win and introducing me to this great blog! Very nice giveaway from The Bead Shop. I'm a blog subscriber. Hi Pearl, I'm so happy to see you and Beadshop.com connected! I became your follower a year ago. I've been a fan of beadshop.com and took classes from their Palo Alto store. I love their selection of beads and supplies! I love this shop! Their designs are awesome. I need more supplies. Thanks for a chance to win! I've watched the kimono cord/silk wrap tutorial several times - it's fascinating and she's so clear with instructions - would love to win the $100 to purchase supplies to actually DO it!! Thank SO much for this giveaway, Pearl & Janice!! I could really use an entry as well as some of these supplies. Thanks for the information! I checked out Bead Shop and would enjoy a shopping spree! :-) Thanks for the chance! I'm an e-mail subscriber hycat@aol.com. I would love having the supplies for new projects. Posted this to Facebook also. The Bead Shop: I love their products and have spent many an hour viewing their products and video tutorials. I would love to enter this contest and it would be great to win if that were possible. I know exactly what I want to buy from them! I love the colors of their products and colors of the cording that they use and the beads they have selected. Also, I am a subscriber to your blog. I enjoy reading it very much. Love the micro macrame necklace! I will HAVE to try it! Thanks! I am already a subscriber to your blog! You have some very nice products! Thanks for the opportunity to win! I LOVE the Bead Shop! I have been buying from them for several years and they are AWESOME! I've emailed questions and always gotten a quick response. The staff always goes above and beyond; in fact, I ordered the Ultimate Design Board thinking it had pegs for knotting. Sam called me to say there were not actual pegs on the board and apologized for the description not being clear enough. I was SO impressed that she called me to be sure the board was exactly what I wanted. I kept it and love it! I love their videos as well. I have made several bracelets from their "In the Garden" series - "Honey Bee," a cheery yellow, and "Orchid," a pretty, deep purple. The video made it so simple to do; easy-to-follow and very detailed without bogging you down with information. I have also made their leather Tahoe Bracelet for myself and several friends. I can also attest to the quality of their gemstone strands. The carnelian strand I purchased last fall was beautiful and very sparkly. I made a simple strand necklace and get lots of compliments. Can't say enough about the quality of their products or their customer service. Love them! Doesn't look like my first post went through so I'm redoing. LOVE the Bead Shop! They have fabulous products and their customer service is outstanding. I bought an Ultimate Bead Board thinking it had pegs on it. Sam personally called me to explain it did not and offered me a full refund because she wanted me to be completely satisfied with my purchase. I loved the board and kept it but was so impressed that she actually called me! Also love their videos - very instructional but simple and informative. I've made several bracelets from their "In the Garden" series - "Honey Bee," which is a cheery yellow, and "Orchid," which is a rich purple. I've also made several of the leather Tahoe bracelets. The quality of their gemstone strands is also outstanding. I ordered some carnelian last fall and made a simple strand necklace. Because the stones were so sparkly, it stood well on its own. Can't say enough about their quality and customer service! Love them! I'm having a good time learning all these cool techniques. So much wonderful instruction here. So yes I would like to enter the contest, the more product I have the more I can learn. Such an inspiration for me... Love your amazing work! Seems like an awesome shop, filled with very good ideas. Thanks for the giveaway ! Oh I was wondering where to pick up some more Superlon. Great timing Pearl! I could always use supplies. Thanks for the give aways. Oh yes please enter me in this great giveaway! I subscribe to you blog via email. Hi I'd love to be entered in the contest. I'm a blog subscriber, on Facebook and email subscriber. I adore Beadshop and have been a fan for years. I am right in the midst of an "in the garden" wrap bracelet and last week finished a Harvest bracelet, using the hand made loom. What a wonderful inspiration Janice is! I will share your giveaway on Facebook via the Beadhop page, and I will happily subscribe to your journal! You are great! 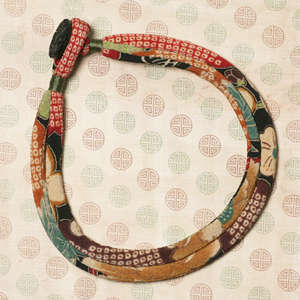 PS:I love the kimono cord as well and had a ball making the necklace! Love their bracelet tutorials. Would love to win a gift certificate. Follow and enjoy your blog. I'll have to check out the Bead shop. Those wrapped bracelets are awesome! great tutorials, thanks for the gift certificate opportunity. Love The Bead Shop! I have purchased many items from them, I particularly love their variety of ethnic and tribal beads and findings. Their tutorials are great too. Keeping my fingers crossed about the $100 shopping spree. and I am a long time subsriber/follower of The Beading Gem. Thanks for the giveway. I love the kimono cord, I would love to get some! Love your blog & I'll definitely be checking out the Bead Shop. I need a quality faux suede & I haven't found a consistent supplier yet. Just tweeted again about your post and giveaway. I am on your email list. I would love to win the $100 giveaway. It could surely in getting my passion closer to being a business. Thank you for some amazing tips and ideas.